Wyoming County Chamber of Commerce president Gina Suydam (top) offers welcoming remarks at the business luncheon series meeting held at Shadowbrook Resort on Dec. 12. 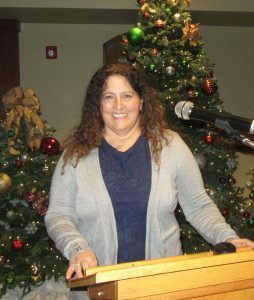 Teri Ooms (above) of the Institute for Public Policy & Economic Development served as the keynote speaker for the event. 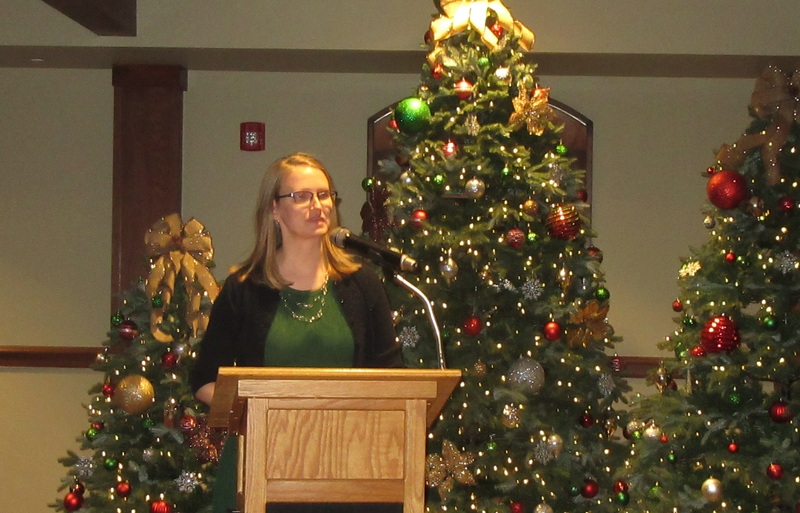 Attendees of the Wyoming County Chamber of Commerce (WyCCC) December installment of the Business Series Luncheons got a good dose of statistics and the formulas used to determine how the region’s economy compares to the nation and the rest of the state. But, more importantly, Institute for Public Policy & Economic Development executive director Teri Ooms laid out the basic ingredients for the recipe needed to secure Wyoming County’s economic future. “Teri provided a thought-provoking outlook on local labor needs for the next decade,” said Tony Gabello, president and CEO PS Bank, which sponsored the event. The primary goal of the Institute is to increase capacity of organizations like the Chamber to solve their own problems and become thriving entities. While the national economy is booming, Ooms explained, Wyoming, Luzerne, and Lackawanna counties – viewed together as a single MSA (market survey area) – are lagging behind in most areas. The trend will continue, she maintained, unless schools immediately embrace and foster career awareness instruction beginning at the elementary level and the Chamber and its members work together to attract a greater variety of industries and career opportunities to the area. Not all of the news is dire of course. Wyoming County has a higher density of industries than the other two counties in the MSA and the highest average wages at $47,355. Income is growing steadily at 3.5 percent, which is comparable to Lackawanna County and well ahead of Luzerne County. Paper manufacturing, primarily at Procter & Gamble, leads the pack among employment opportunities in Wyoming County, followed by transportation, and oil and gas extraction. But Ooms sees a future where service technicians and installers in alternative energies such as wind and solar are in demand, as well as an ever-increasing need for physicians assistants and others in the health industry. One of the biggest challenges by far is that baby boomers are retiring at a rate that far outpaces the growth of a ready workforce. She predicts a need for 22,000 skilled workers in specialized fields within the next 10 years. That is roughly equivalent, Suydam noted, to the entire population of Wyoming County. Drivers and materials movers will be needed, as are technicians and field operators for the natural gas industry, which is experiencing a robust comeback after a four-year lull. “The key to success over the next several decades is talent,” Ooms stressed. “Educators of students from K through 12 need to be prepared now to fill those gaps.” She further recommended that students at the grade school level be exposed now to the job needs of the future, as most students have already mapped out their high school curriculum by the time they reach the eighth grade. The Ready PA program, Ooms noted, is poised to help administrators make that rapid transition. “Not every child is meant to have a four-year degree, even though many parents still think that,” said Ooms, noting that there are a growing number of paths to earning a decent living wage via associate degrees and technical training at career centers that partner with schools. Suydam sees additional opportunities for the Chamber’s Leadership Wyoming program participants to help local educators make those pathways more attractive to younger students. Last year’s class conducted a career fair, the template of which the Tunkhannock School District can modify to keep up with changing industry trends and needs. “I am proud to have our Leadership Wyoming classes for the past two years focusing on our future workforce,” she stated. Additional suggestions proposed by Ooms is that communities must work together to attract and retain talent. Skip the 20-somethings, she remarked, as they are more likely to be drawn to cities and less likely to be interested in settling down, starting a family and driving to work. “Aim for people in their late 20s and early 30s instead,” Ooms recommended. For many of them, she suggested, sowing their wild oats and city living is already out of their system. Nonetheless, she maintained, accessibility to recreation and green spaces, arts and culture, and higher wages are all keys to attracting new people to the area and retaining the talented adults who would prefer to stay closer to home. Gabello complimented Suydam and the Wyoming County Chamber of Commerce for the relevance of the business speakers series. The next Chamber luncheon will be held at the Susquehanna County Career & Technology Center in Springville on Wednesday, January 9. Executive director Dr. Alice Davis will be the keynote speaker. For more information, interested readers may call the chamber at 570-836-7755 or log on to www.wyccc.com/events.